The Chinese Water Dragon (Physignathus cocincinus) is a species of agamid lizard native to China and Indochina. It is also known as Asian Water Dragon, Thai Water Dragon, and Green Water Dragon. 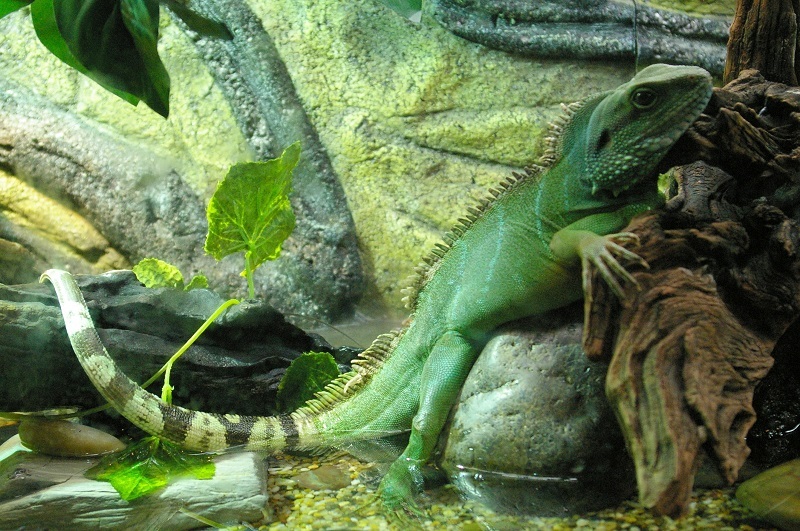 Chinese Water Dragons can attain a length of up to 1 m (3.3 ft) in total, including tail. Coloration usually ranges from dark to light green. Diagonal stripes of green or turquoise are found on the body, while the tail is banded from the middle to the end with green and dark brown. Their undersides range from white, off white, very pale green, or pale yellow. But their throats are considered to be more attractive, which can be quite colourful (generally yellow, orange, or peach), some with a single colour, some with stripes. Sexual Dimorphism means that adult males have larger, more triangular heads than females, and develop larger crests on the head, neck and tail, and are larger in general as with most lizards. The tail, slightly over two-thirds of the entire body length, can be used as a weapon, for balance, and to assist swimming. Like many other reptiles the Chinese water dragon possesses a small, iridescent, photosensitive spot between their eyes referred to as the pineal eye (or parietal eye, or colloquially as the third eye) that is thought to help thermo regulate their bodies by sensing differences in light to assist with basking and seeking shelter after sunset. Since it recognizes differences in light, the parietal eye can also help the lizard avoid predation from birds and other aerial threats, and can awaken from deep sleep from even slight changes in light from overhead. Native to the lowland and highland forests of southern China and south-eastern Asia (Thailand, Vietnam, Laos, Cambodia and Burma), Chinese water dragons are most commonly found along the banks of freshwater lakes and streams. They are active during the day (diurnal), and spend most of their time in the trees or plants (arboreal). If threatened, the dragon will drop from the trees into the water and either swim to safety or remain submerged for up to 25 minutes. Chinese Water Dragons are omnivorous and will eat vegetation, the diet of the water dragon consists mainly of insects, supplemented with an occasional small fish, mammal or reptile. Click HERE for a Chinese Water Dragon care sheet.